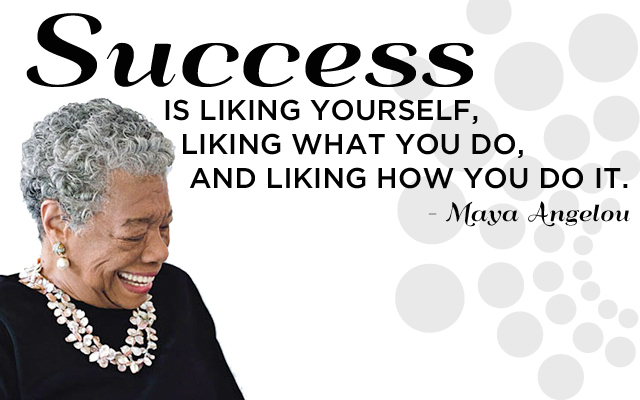 My January Wisdom Wednesday post is about the one and only, Maya Angelou. (Birth name: Marguerite Annie Johnson) Maya Angelou was an extraordinary woman, many people, from different generations have admired for years. Her list of credentials are nothing short of amazing. From Pulitzer Prize recipient, to well-known activist in multiple countries, Ms. Angelou was a woman who lived by the definition of compassion and courage. Although Ms. Angelou’s resume trumps a majority of the human race, there was one particular title she held that inspired me when I was in middle school. The title was, poet. Her poetry is what many people know her for, but there was something about the words in the poem “Still I Rise” that gave a younger me such a feeling of empowerment. Which for any young girl in her soon-to-be early teens, couldn’t have enough of at the time. It was at the moment I read “Still I Rise” I realized I wanted to read more of her writing. I Know Why the Caged Bird Sings is still to this day one of the most emotionally driven, beautifully upsetting, books I have ever read. If you have not read it, I would encourage you to read the book and learn in detail what made Maya Angelou such a remarkable person, at an extremely young age. As many people know, she was raped at the age of eight by her mother’s boyfriend at the time, and when his punishment didn’t fit the crime, (as most of us would say) it is suspected her uncles took matters into their own hands and killed the man days later. Maya became a mute and didn’t speak for over five years, because she believed using her words to name the man who raped her are what had gotten him killed. 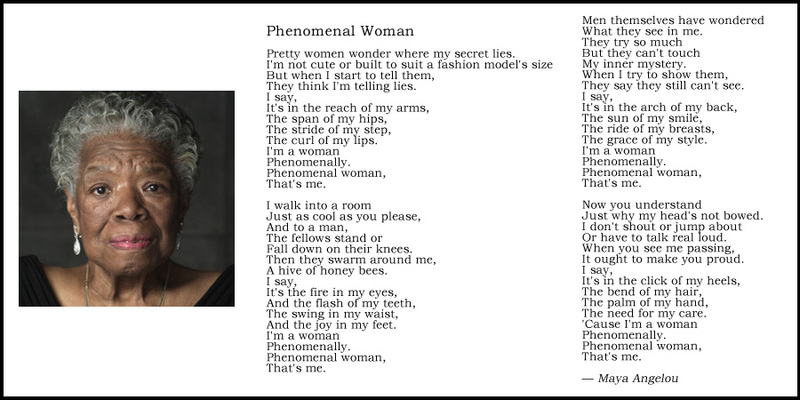 By the time I had made it to high school my favorite poem by Ms. Angelou, and still to this day is Phenomenal Woman. The poem makes me love everything about being a woman. It makes me love every curve and flaw on my body, as well as, make me appreciate the difference and beauty of every woman’s body. If for some reason you have not had the pleasure of hearing or reading this poem before, please do so. Ms. Angelou died on May 28th, 2014. I read the news of her passing as I got off of the plane in Denver Airport from Chicago, IL, to board my next plane back to Great Falls, MT. I remember feeling an instant wave of sadness because the world had lost such a beautiful person. Maya Angelou inspires me because her life journey proves life is about the choices we make, and how we overcome mistakes we make. She is the definition of learning to stand for what we believe in, and how our words can change lives positively if we use them lovingly and wisely. I’m thankful I was alive during the last 25 years of her life to see her work in action. I will be sure to teach my daughter about her so she can learn the same life lessons I did from Ms. Angelou at a young age through her beautiful words.